This ant killer is great because it kills off the entire colony easily without much effort. These stakes are very effective and easy to use for killing off outdoor ant colonies. This outdoor ant spray is great for tough to reach places and kills the ants immediately on contact. Having a normal number of ants outside your home is not an issue, but if they start to become a problem and to infest your outdoor living spaces, it can start to get annoying. The most important thing you can do for yourself kills the colony instead of wasting time on the ants individually. 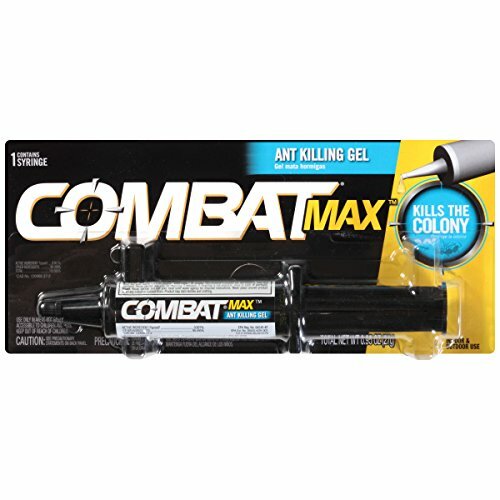 In this article, we are going to review some of the best products for killing the colony outside before you have to deal with the ants inside. This ant bait is ideal for massive outdoor infestations because they have killed off the colony by allowing the worker ants to transport the poison to the rest of the colony and queen. 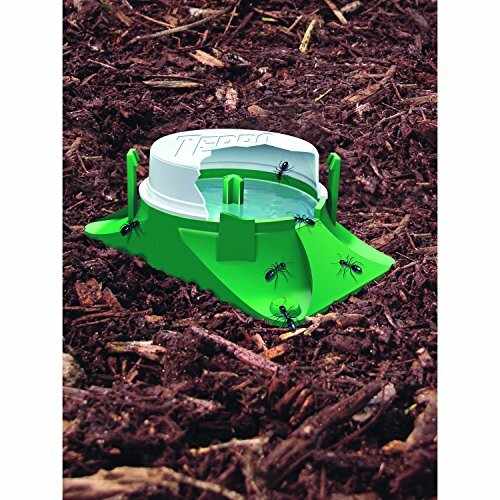 In comparison to some other traps that contain the infestation or kill it off one by one, this ant bait is perfect at eliminating the entire colony quickly and preventing it from spreading into your home. This trap can kill all forms of common household ants including Argentine ants, ghost ants, cornfield ants, acrobat ants, pavement ants, little black ants, white-footed ants, odorous house ants, and sweet-eating ants. This trap is excellent at getting the ants that you do not see out in the open because of the slow process it takes on the worker ants. enough poison and it kills them slowly enough to allow them to bring the bait back to the colony and kill off the entire colony and the queen. 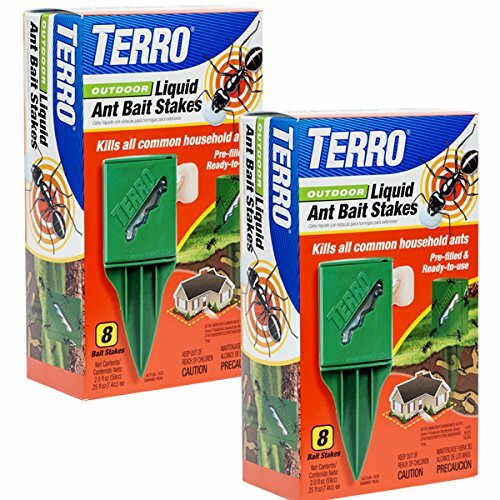 These stakes attract all forms of common household ants, and the bait contains 16 weatherproof stakes that are ready to use right out of the box. One of the great features of these stakes is that you can see through them, so you know precisely how much bait is left inside. This makes it easy for you to replace them and not waste any time wondering how much is left. These stakes get stuck in the ground in areas where you believe the worker ants are traveling and it takes approximately two weeks to kill off the entire colony from one stake. Each pack contains eight stakes, and this comes in a two pack. This outdoor ant spray is a 19oz aerosol spray can that makes this perfect for getting ant colonies in tight to reach places like behind outdoor furniture, sheds, barns, fences, etc. This spray works for immediately kill on contact and is also very effective at controlling the population of ants in the future. Using the spray can you can spray into hard-to-reach places as deep as 15 feet away. This ant killer works great for sprinkling in cracks of doors, windows, and cracks in foundations as well. 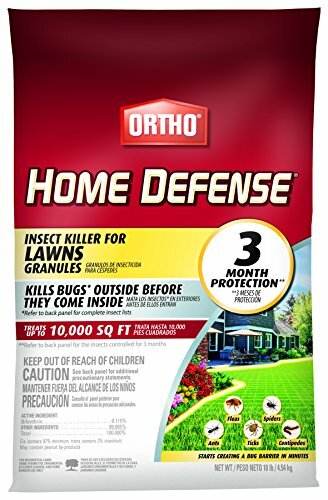 The manufacturer recommends using it outside around the foundation of your home in the early spring when ants try to enter the house. They also suggest it at the beginning of fall. This ant killer gel is simple and effective. The gel is intended to bait the worker ants to gather it up and take it back to the colony for everyone to feet on. This method kills off the entire colony slowly and also takes out the queen. This strategy is an effective method of taking down whole colonies with little effort. The gel is designed with a high water content, so it allows the ants to consume it faster and this allows the ant colony to start depleting within one hour and the entire colony can get destroyed within three to five days. The gel comes with a syringe which allows you to apply this gel to difficult to reach areas without making a mess. This gel is incredibly effective at attracting ants from the areas where you cannot see them inside your home. You can use this along with the perimeter of areas where you see a lot of ants. This is a popular lawn pest control product that is effective at treating and preventing large-scale infestations from a variety of pests. This insect killer offers three-month protection against a variety of bugs. The lawn treatment is meant to kill the infestation outside before you have to deal with them inside. This product comes in a 10lb. Bag of lawn granules that treats up to 10,000 square feet. Effective at killing ants, fleas, ticks, mites, and more. The lawn granules are okay to use on flowers and vegetable gardens as well as along your home’s foundation. The best way to control the outdoor ant population is always to kill the entire colony at the core. You want to be able to locate where the ants are coming from and what their traffic patterns are. If you know where the worker ants go to forage, you can interrupt their habit with a trap and bait. Early in the morning when they are most active, you can then place the bait in the middle of this travel path and force them to take it back to their queen. Once they do this, and the queen feeds from the bait this will slowly kill the entire colony within two weeks and you will have no more ant issue in your yard. If you cannot locate the travel path or any of the mounds an entire lawn treatment would be an effective way to kill off the colony. This plan will treat the whole lawn so even the underground colonies will get affected once your water in the treatment. This is not the same as baiting them because you are not actually baiting the ants–you are using a pesticide to kill of the entire colony. Whenever possible use a liquid or a gel bait, these are the most effective ways to guarantee that the ants are attracted to the bait and the high water content of the liquid allows the ants to consume the bait faster and thus killing off the population faster. All in all, killing off an entire ant colony requires patience and persistence. If one strategy does not work, do not get discouraged. Continue trying different methods until the problem is gone. Killing off an entire ant colony requires patience and persistence. If you are having trouble locating a colony in your yard there are a few things you can do to reassure yourself that you have successfully found the source of your ant problem. Check to see if you have small piles of loose soil sitting on the surface of your yard. The soil often looks like sawdust because the ants chew it up and push it out the hole. Some ants live in damp wood, and the same process applies. Check to see if there are small holes in the wood with piles of wood dust sitting on top of the logs or around it. If there is an abundance of this that could be the source of your infestation and it would be best to bait near there or spray it down with dust or insecticide.